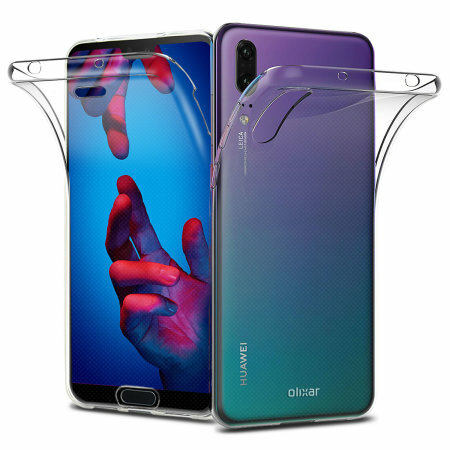 At last, a Huawei P20 case that offers all around front, back and sides protection and still allows full use of the phone. The Olixar FlexiCover in crystal clear is the most functional and protective gel case yet. This is a great case that protects well your phone. With 2 young kids and me being careless and clumsy, the phone is constantly falling to the floor and after several weeks, I can say this protects well. I was initially worried about the reviews commenting on how they affect the screen responsiveness. This is not something that I have experience myself. I am a moderate user and I do not type messages with both hands, just with one finger. I was also worried about comments that it is not 100% clear. The case looks like if it had lots of tiny pin holes. I must say these are really tiny and do not bother me. Yes, the images are slightly less clear but it is still very good. For example, if you are reviewing photos, you still can see them perfectly well. Provides all round protection and can still use phone. Screen is not quite as sensitive and requires firmer swipes and taps. Also obscures/reduces screen quality. Having paid top dollar for a good screen pic, seems to defeat the object. I did not want to have a case with cover as pain in the rear having it flap around. I need to decide the lesser of two disadvantages. The case arrived in two days. But I changed the phone as the P20 turned out not to meet my requirements, and I changed it for the slightly bigger P20 Pro. Mobile fun sent me another case without requiring I return the original. Love this case, all the benefits of protecting your phone with a case, with the bonus of not adding bulk to your handset. Would definitely recommend. The rear case protector is perfect which I bought for my wife's new P20. The front screen protector will certainly protect but after just one day it was taken off as the tactility is affected. We gave it to my daughter in law to try out as she already had a rear protector fitted. Likewise she removed it for the same reason. The phone case is good quality and easy to grip. The only negative I have of this case is that the colour of your phone doesn't stand out as much but other than that it's perfect. It protect the phone very well.